Motion detecton is an essential feature of any surveillance system that strives to be effective. There can be no professional software for monitoring and security without it. Xeoma Video Surveillance Software is not an exclusion. 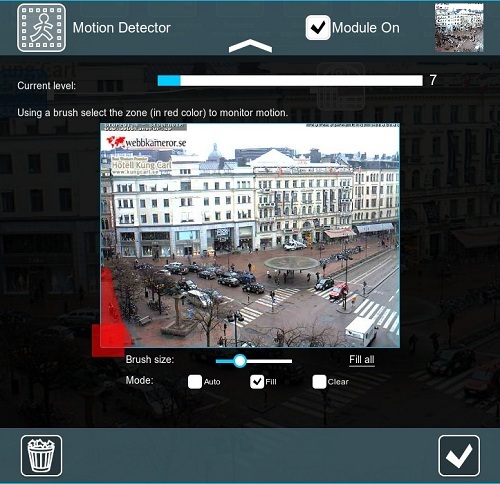 Motion detector is one of the features that makes Xeoma professional high-quality software for flawless monitoring. Thanks to many setting possibilities, motion detector of Xeoma can be set up just the way you need. First of all, you can set up the zone of any shape of size in the view of your camera to monitor. That means motion in the selected area will provoke an alert and every movement outside of the area will be ignored. Use red color to define the area where motion is to be monitored. Leave transparent spots where motion will be ignored. For example, you only need motion detection at the entrance of your door with your camera facing the street, and you don’t need to be alarmed every time car is driving by. Just select with red color the entrance road and leave the street road transparent. The brush is also size-adjustable for more accurate setting up of a monitored zone. You can delete false lines or spots like in any visual editor. Sensitivity level is also of help where motion can be of different nature. For example, you want to be alarmed only if a human is there in the monitored area and if there are animals – you don’t want system to react. It is mostly needed if the scenery is complicated. In case you have a pet who can walk around the apartment to avoid false alarms triggered by motion of pets or leaves in the yard. 0 sensitivity level denotes that the system will be very sensitive to any objects of any speed or size. 100 means high sensitivity level, at this level only major objects with unquestionable motion will trigger the alarm or any other action your specified. The scale of current sensitivity level lets you know what speed and rate of motion is needed to make your system react. For your comfort, starting with Xeoma 12.3.30, Xeoma has the advanced motion detector. Now you can also specify how long motion is to continue and what minimal size of the object is to be to make system react. For example, if someone passes by your front door to cut the path between yards in just 3 secs, but if the intruders stays longer you will be alarmed. There’s also a parameter that helps you specify what period of time that precedes the moment the motion is detected will an archive store. You will be able to watch all the event from its very start to the very end and see what was there before the motion was detected. There’s also postrecording configuration enabling you to specify for how long will the system continue recording after the motion has ended. With the “Detect only the absence of motion during” option you can make the motion detector work in reverse and detect only when motion in front of the camera stopped, for example, when counters or moving parts of equipment are being monitored. Use the slider to set time – if motion will be absent for more than this value, the following modules will be triggered. “Continuous work to enable search by motion in the archive”: if ticked, the motion detector will be switched to the “Skipping” state (when archive is connected after the motion detector, it will conduct continuous recording). The option is used when continuous recording is required but search by motion is needed in the archive. This way the motion detector will only collect data about motion events. 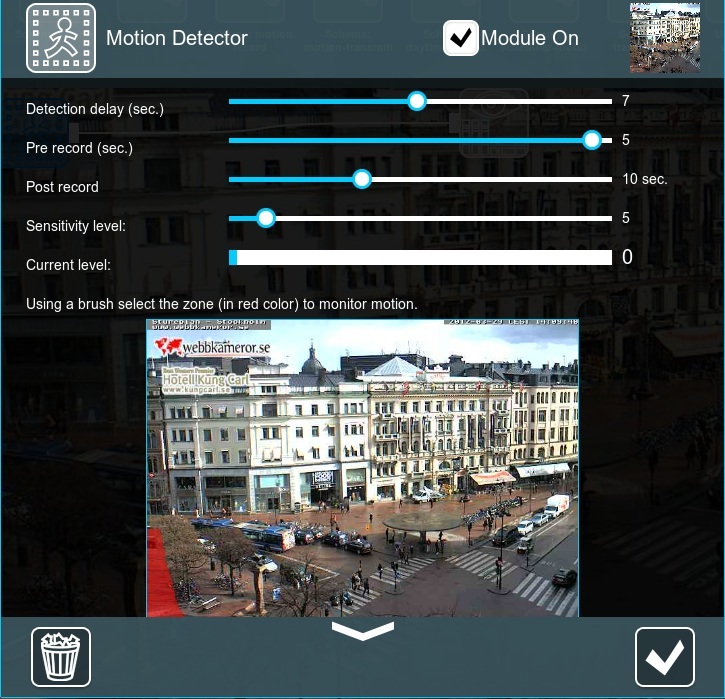 Motion detecton is one of irreplaceable features in up-to-date surveillance software. We provided it with so many option to meet your request the way you need.